It was a cold snap that had most of the east coast of Australia shivering. Starting around the 11th of July 2015, a big cold front from Antarctica combined with an east coast low saw snow falling from Tasmania all the way up to Stanthorpe in Queensland. It wasn't a quick event either lasting for a solid week or so and people were scrambling to keep warm. I even had a mate call me from far North QLD in Port Douglas to say the temperature had gotten as low as 10 degrees Celsius. Not owning a jumper anymore, he decided to go to bed early and curl up under the doona. Hey, why not? Anyway, back here in the Blue Mountains in NSW I knew we had some good snow falls on the way so I thought I would get out early before the really deep stuff came and all the roads were closed. I wanted to take my teenage son out to see the snow around Black Springs, south of Oberon where I used to play allot back in the days when significant snow falls happened regularly during winter. 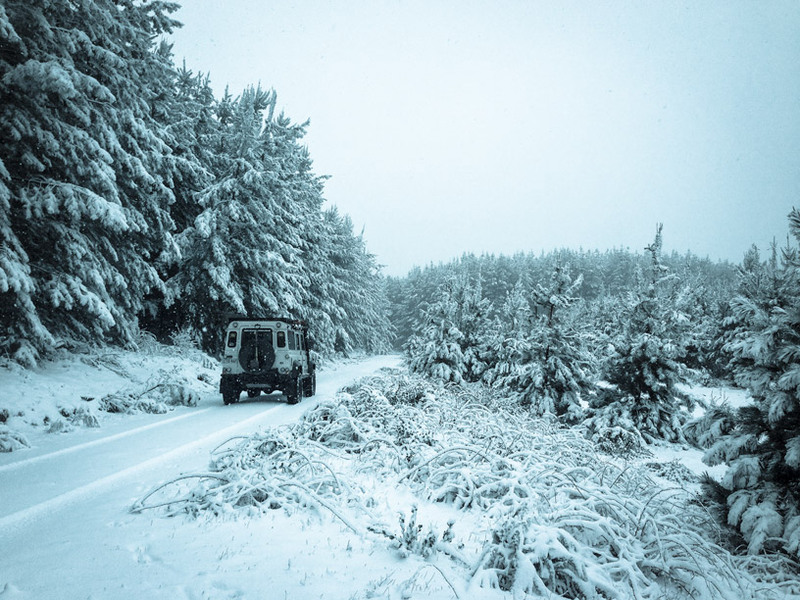 We left home on the Sunday morning , the snow falls just starting to creep into the mountains and I knew that at around 1300m the state forests around Black Springs would already have good snow on the ground. Passing through the Vulkan State Forrest the snow/ sleet was starting to fall from around Medlow Bath – Blackheath but nothing too serious and certainly nothing that was settling yet, so safe to proceed. Dropping down Mt Vic pass into Hartley it cleared up again but we could see the ominous snow clouds off to the south west. As we started to climb back out of the valley into Hampton we could see small snow showers in the distance and a few patches of settled snow on the ground, remnants of the falls from the night before. The further we travelled the more we saw and before we knew it we were approaching Black Springs. The snow was everywhere! It was almost as though we were looking at a black and white image as the normally green pastures were completely covered in the white stuff and the weather had really closed in leaving us shrouded in a heavy dark grey. The occasional flurries of snow were now falling and it was truly a beautiful sight and one I had not seen for quite some years. In recent years the snow falls in the area have not been as heavy or as often as they used to be and when there has been snow on the ground I have not been able to get out and see it. So I was glad to finally time it right and not only get to see it myself, but to introduce my son the beauty of our prime grazing country covered in six inches of fresh white powder snow. Moving into the Vulkan State Forrest it was as though we had been transported to a European winter wonderland with snow covered pines as far as the eye could see. The only thing that reminded us that this was not the case was the fresh kangaroo tracks in the otherwise untouched snow and the occasional wombat hole just off the road. We explored a few tracks and stopped by a small dam, all of which looked so much better and somehow special when covered in snow as opposed to the normally harsh clay and rocky terrain we would normally experience in the area. After a couple of hours of exploration and sightseeing we decided to stop for a bite to eat and a warm beverage. Of course I had water in the truck but I thought it would be fun to melt some snow in the kettle and make our drinks from that. A small thing I know, but not something we do not get to do here very often. With our bellies full and a successful hot chocolate each, we were ready to make a final run through the forest and back onto the blacktop for the trip home. With the main cold front still moving in, the snow was getting heavier and I knew the roads would soon be closed down, so off we went. The trip home was uneventful but the entire way we were wishing we had the time to set up camp and stay a couple of days and really get to enjoy the area whilst in this unusual and special state.